Winds and rain started picking up in Coeur D’Alene yesterday afternoon. By mid to late afternoon it was raging through the whole North Idaho Panhandle from Coeur D’Alene to Bonners Ferry and the Canadian Border. It was obvious the moment the winds got to where ever you were, at the time, this was not going to be a light breeze. Trees being blown over and Semi Truck on its side on the highway. Power outages continued through the night and most are still needing repair as of this afternoon. 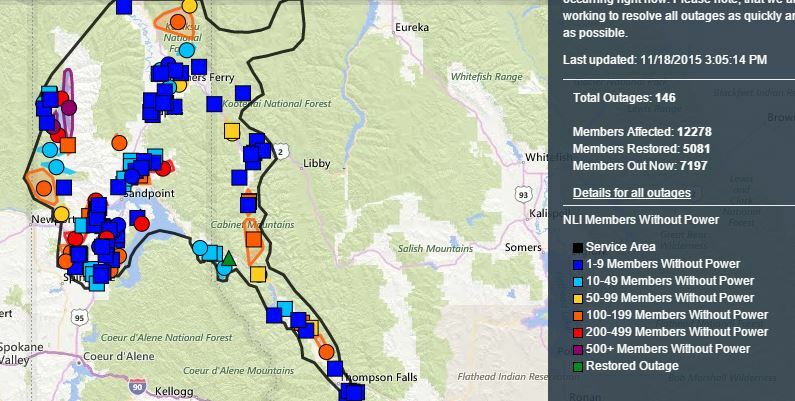 This map shows the outages as show by Northern Lights Coop of North Idaho.